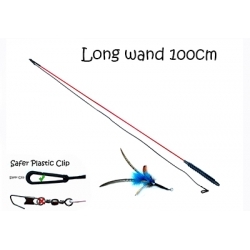 PurrSuit Interactive Interchangeable Cat Toy - LONG 100cm Rod with safer plastic clip and handle. Comes with 1 feather spinning prey clipon. This is the 100cm Long single one part rod. A single flexible rod, 100cm in length, made from fibreglass and covered in a red or yellow (colour preference unavailable) rubber sheath to stop all possibility of fibreglass splinters. 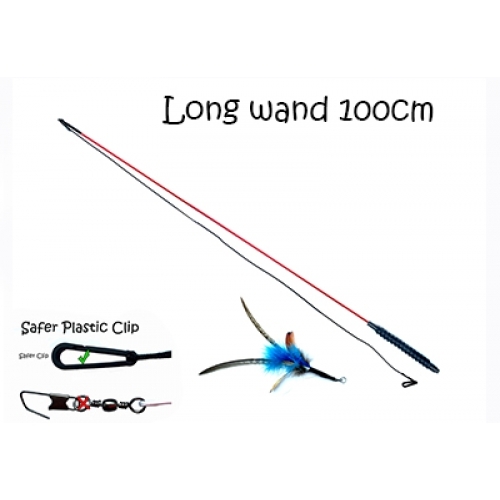 A 100cm long black strong cord , safe plastic clip and comes with one feather spinning attachment. Fibreglass Splinters - The wand is completely covered in a fun coloured rubber sheath to stop hurtful splinters in your hand. Safer Plastic Clip - Other manufacturers use a metal clip with a metal pin at the end of the cord to attach the prey toys. The PurrSuit has an easy to use, strong plastic clip with no sharp pin for safer play near your cat. Soft grip Handle - More comfortable to hold with a soft grip handle.